Love the look of light wood floors but not sure if it works with your kitchen style? One of my clients faced a similar dilemma recently, prompting this journal post. This client is going through a complete gut renovation of her 2,500 SF condo in Chicago's Streeterville neighborhood. She is going for a modern kitchen style, and wanted to select neutral materials that would appeal to prospective buyers. 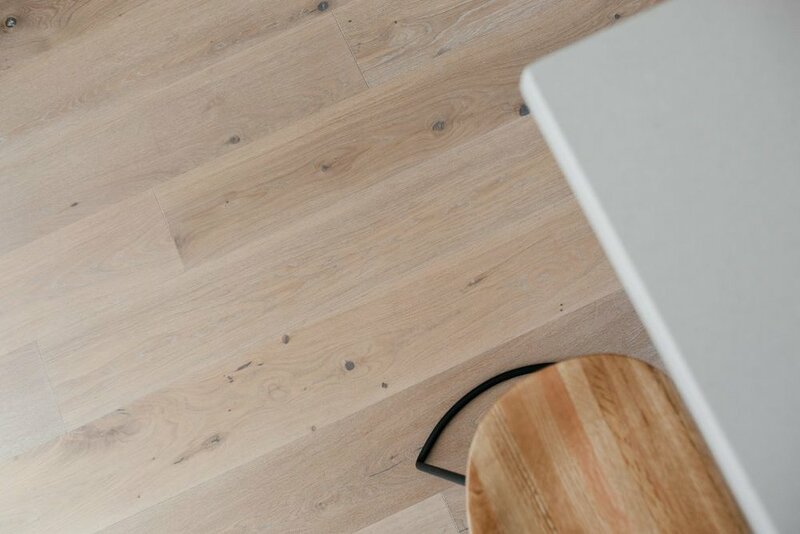 I recommended white oak for the kitchen floors because this type of wood has almost no yellow or red undertones (making it as neutral as it gets!). White oak typically comes from Europe, and is less yellow than the oak harvested in the US. Since it's very neutral, it complements a wider range of materials and colors more easily. My client's only hesitation was that the light wood flooring might look "too country" for her modern dream kitchen. Quite the opposite, I explained! Depending on the width of the wood planks, stain, finish, and level of distressing, the same wood material can create completely different looks. To demonstrate my point, I pulled the some imagery to show how light wood floors can look great in any kitchen style! My original inspiration for suggesting light wood floors to this client came from these two modern kitchens. Both kitchens have light oak wood flooring in a chevron pattern; The left flooring example has a more distressed look, which gives a Belgian minimalist feel, while the right has a very soft and even finish, creating a serene, modern look. In these two contemporary kitchens, the light wood floors have a similar grey undertone. This warm grey undertone complements the dark accent materials: countertops and barstools (LEFT), and metal doors and lighting hardware (RIGHT). The wood planks look to be 5-6 inches in width, which is the right scale for these two medium size kitchens. I personally love the serene look of light floors in modern kitchens! I noticed that in both examples, the wood flooring has an even color finish and almost no knotting. These elements help to achieve a matte, and almost radiant look, blending perfectly with the flat-panel kitchen cabinets and marble waterfall islands. Wider planks create a more casual feel, and therefore look especially great in eclectic and beach-style kitchens. The flooring in this first example has a rich, warm color and silky sheen. It demonstrates how you can mix and match different wood species, as the upper cabinets and barstools are a darker wood (probably Walnut) compared to the floors. In these two eclectic kitchens, the wood flooring also has a silky sheen, which feels slightly dressy. The kitchen on the right has flooring with more knotting, which paired with the classic subway tile, creates a French, industrial vintage look. 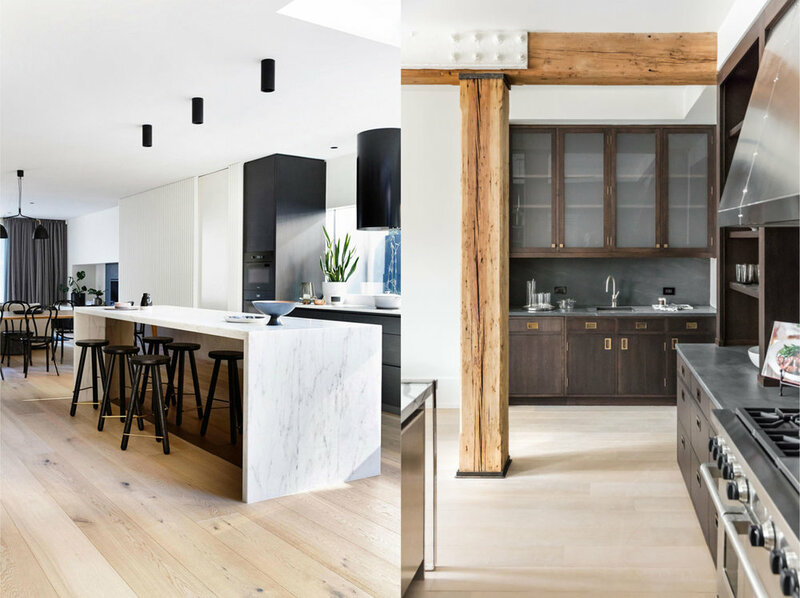 In these two very chic, industrial kitchens, the wood floors appear to be a bleached oak. This creates a strong juxtaposition with the the other raw and natural materials, primarily because of the color contrast. What's great about the bleached wood floors, is that like a blank canvas, it allows the other other elements in the kitchen to really pop. Rustic kitchens look especially great with light wood floors that are unfinished - that is to say, no color stain or speciality finish. In both kitchens, the floors also look slightly distressed and have knotting and uneven coloration. This creates the illusion of being installed haphazardly, as if in a cabin or French countryside home. Whether in an modern or rustic kitchen, light wood floors can create a soft and elegant feel. Light floors also brighten up spaces, and creates a neutral canvas for the rest of the kitchen materials to shine. Here are some of favorite wood flooring sources and collections. If you have any others, I'd love to hear about them.